Tom O'Brien, John Gilbert, and Karl Dane sharing a foxhole in the World War I drama 'The Big Parade' (1925). In introducing films lately, I've found myself choking up a bit when I get to the upcoming 100th anniversary of Armistice Day, when the guns in Europe went silent. Well, the long march to the big day is nearing an end. On Sunday, Nov. 11, 2018, it will be a full century since World War I ended. On that day, I'm honored to do live music for one of the great films about that conflict, 'The Big Parade' (1925) at the Somerville Theatre in Davis Square, Somerville, Mass. We're using a 35mm print for the screening, which starts at 2 p.m. More info is available in the press release I've pasted in below, and I hope you'll attend. The emotional thing happened again last night prior to a screening of 'Wings' (1927) for a packed house at Red River Theatres in Concord, N.H. Introducing the film, I kinda choked up for a moment. 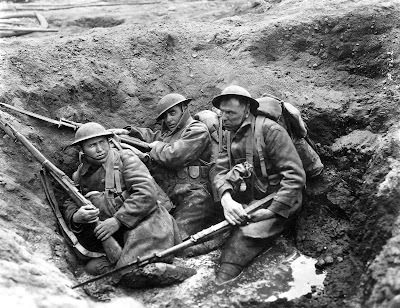 I thought about it, and I recognized a pattern: it always happens when I say that no one is among us who was there: who wore the uniform, who shipped off to Europe, who fought alongside others, who awoke 100 years ago this Sunday to the blessed sound of silence. And that gets to me, I think, because it so vividly illustrates the impermanence of what we as human beings experience. On Nov. 11, 1918, the entire human race, more or less, shared the experience knowing that a huge and unthinkably awful war had finally ended. It was a conflict that would cast a shadow over the next century and beyond, influencing events around us even day. But now, just a few generations later, the human experience of World War I produces a silence that's different from that heard on the European battlefields that morning. It's the eternal silence that subsumes everything as the present becomes the past—the past which every passing day and month and year bury deeper and deeper, as it inevitably must. It's a process that humans grapple with in many different ways. It's the root of everything from hoarding to ancestor worship. We don't want to lose the past. But the passage of time divorces us from it just the same. I think that's a big reason why I'm drawn to films of the silent era. When we run them, for just a little while, the past is not lost. We breathe life into it and can get a sense of what it was like when the past was the present. In a way, by showing these films, we're able to hear from people who can no longer speak for themselves. And I find that's what stirs my emotions. To me, it's a certain kind of special magic that I think is worth experiencing—especially if it involves a good story, a good cast, and a director with an eye for the visual. 'Wings' has all that, and generated a huge reaction from our sold-out house last night at Red River Theatres. I want to thank my colleagues at the Aviation Museum of New Hampshire for supporting the event, and Red River for continuing to find room for silent film with live music in their schedule. SOMERVILLE, Mass. — It was the 'Saving Private Ryan' of its time — a movie that showed audiences war as experienced by a front line soldier whose life is changed forever by its horrors. It was 'The Big Parade' (1925), a sprawling World War I epic and a box office sensation that made MGM into a powerhouse studio. It's the latest installment of 'Silents, Please!,' a silent film series with live music at the Somerville Theatre. 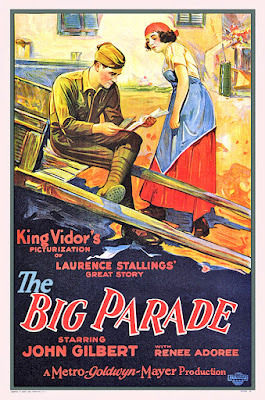 'The Big Parade' will be screened in 35mm one time only at the Somerville Theatre on Sunday, Nov. 11 at 2 p.m. General admission is $15; seniors/students $12. The Veterans Day screening coincides with the 100th anniversary of the Armistice of Nov. 11, 1918, which ended the fighting of World War I. The show will feature live accompaniment by silent film musician Jeff Rapsis. 'The Big Parade,' released just a few years after World War I ended, was hailed by critics as the first Hollywood film to depict the harsh reality of combat and its impact on troops. Its hellish battle scenes were staged on a massive scale and still retain their ability to shock audiences. The picture, based on the best-selling novel "What Price Glory? ", follows the story of a young man (John Gilbert) who rebels against his privileged background by enlisting in the army just before the U.S. enters World War I. He is shipped out to France, where he falls in love with a local French woman before being transferred to the front. There, he and his squadmates face the German war machine, where they must endure the ultimate tests of duty and honor in a battle they come to see as meaningless. In addition to vivid war scenes, the film contains a famous dramatic sequence in which the French woman (Renée Adorée) realizes her love for the soldier, and tries to find him to say goodbye as the massive convoy of troops pulls out for the front. Another celebrated sequence depicts the light-hearted first meeting of the soldier and the girl, in which he teaches her how to chew gum. 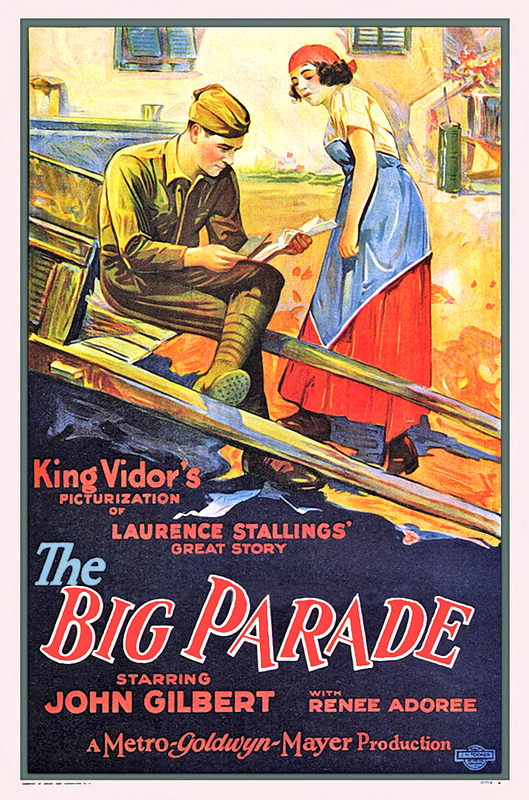 'The Big Parade' went on to become the top-grossing movie of the entire silent film era, earning $6.4 million domestically and making director King Vidor into the Steven Spielberg of his day. It stood as MGM's biggest single box office hit until the release of 'Gone With the Wind' in 1939. "We felt screening 'The Big Parade' on Sunday, Nov. 11 was a suitable way to mark the 100th anniversary of the Armistice," said Somerville manager Ian Judge. "World War I is now part of history, but this picture is from a time when it was foremost in people's minds. What was then called 'The Great War' was the 9/11 of its day, and this film captures that intensity and allows us to experience it today." Rapsis will improvise a musical score to the film in real time. In creating accompaniment for the 'The Big Parade' and other vintage classics, Rapsis tries to bridge the gap between silent film and modern audiences. "Live music adds an element of energy to a silent film screening that's really crucial to the experience," Rapsis said. " 'The Big Parade' is filled with great scenes that lend themselves well to music. It's a real privilege to create a score to help this great picture come back to life," Rapsis said. All entries in the Somerville's silent film series are shown using 35mm prints, the native film format that few theaters are now equipped to run following Hollywood's transition to digital formats. MGM's silent blockbuster ‘The Big Parade’ will be shown in 35mm and with live music on Sunday, Nov. 11 at 2 p.m. at Somerville Theatre, 55 Davis Square, Somerville, Mass. Admission to the screening is $15 or $12 seniors/students; general admission seating. For more info, call (617) 625-5700 or visit www.somervilletheatre.com. For more info on the music, visit www.jeffrapsis.com.